Trio is a work that interrogates the question of change in the musical experience, what does sound feel like, and it further recasts this question as being about the translatability between articulation on different instruments. Each instrument recasts those questions showing how instrument design and ergonomics are to research specificity. 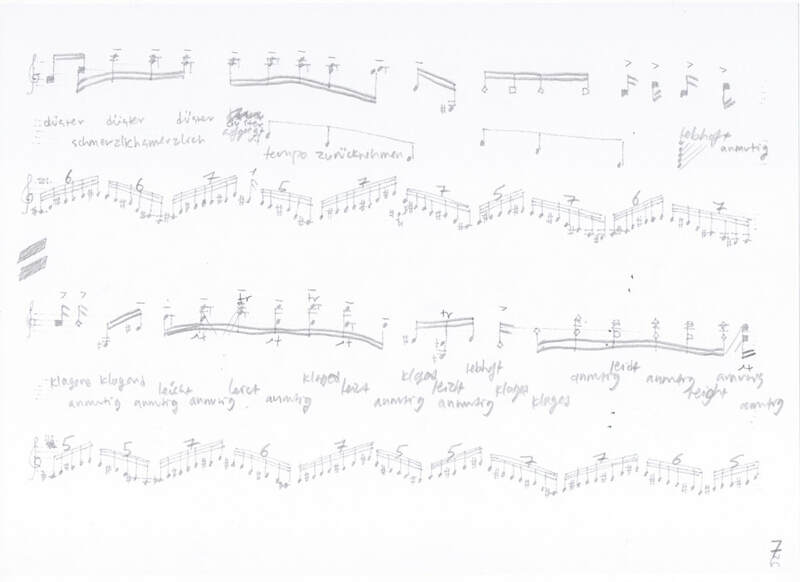 Thus rather than focusing on the specificity of an instrument based notation, it analyses the musicians relation to their instrument through the means available to traditional score. While there is this common structural theme that is used to make abstract formal decisions, each instrumental part is self-contained and demonstrates particulars only available to such a material construction. I want the listener, who is not able to feel the tactile sensation the musicians are making, to be able to appreciate the contrasting results emerging from one instrument when comparing it to the others, as well as appreciate the instruments own particular tactile differences, and to hear those differences and the music that emerges. 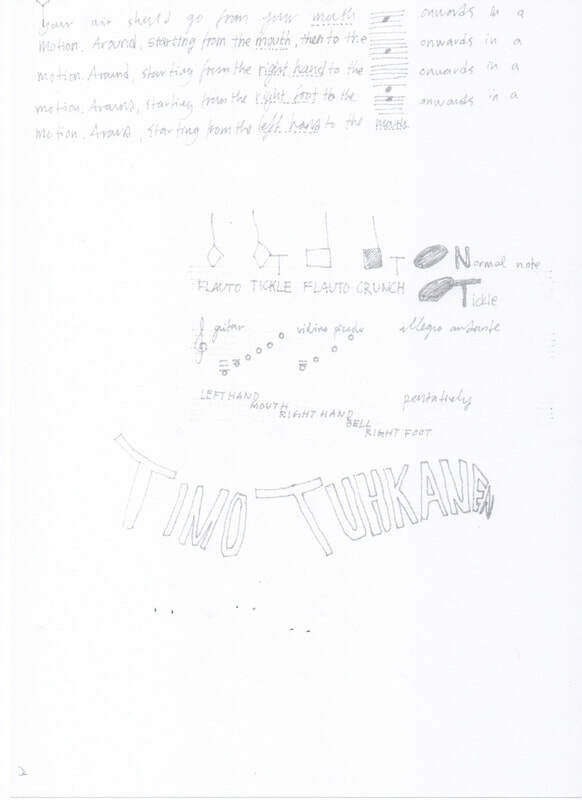 ​Trio is a work that interrogates the question of change in the musical experience, what does sound feel like, and it further recasts this question as being about the translatability between articulation on different instruments. Each instrument recasts those questions showing how instrument design and ergonomics are to research specificity. 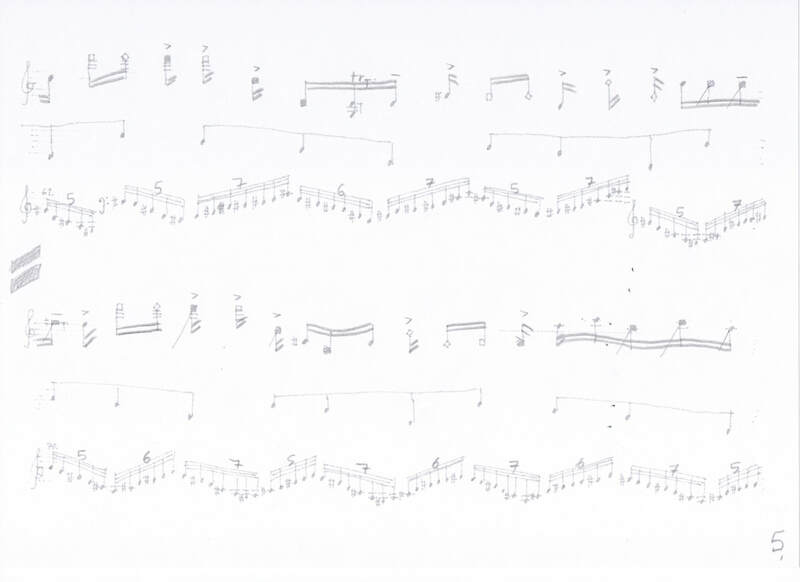 Thus rather than focusing on the specificity of an instrument based notation, it analyses the musicians relation to their instrument through the means available to traditional score. 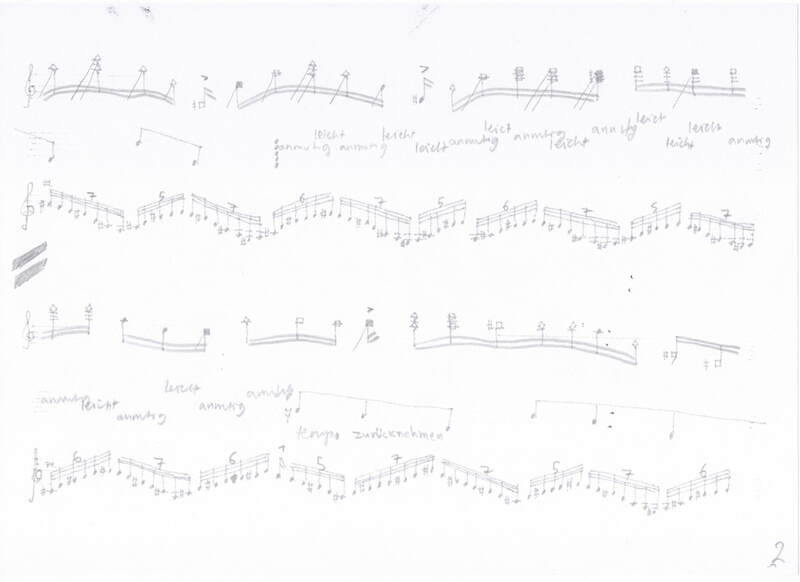 The piece starts of with examining the contact points between the musicians body and the instrument and placing those points in the centre of the music. The violin has two major contact points, the shoulder and chin and the left hand palm and fingers, the instrument also has a third, extended contact point in the right that holds a bow. The guitar has four major contact points, the hands but also the leg and the torso both of which touch the instrument. The trombone also three major contact points, the mouth, and the hands, but can have extended contact points in the legs. The composition uses three structural elements. First there are the contact points between the body and the instrument that bring the attention of the musician to those points. Secondly there is the language of articulation and expression that defines the ways in which touch is administered when those points are focused on. Thirdly there is the movement of the instrument when it is agitated in different ways and these agitations, or vibrations are felt at different contact points and through variations of de-habituated touching of the instruments. For this piece I made lists of articulations in Italian, German, English and Finnish. 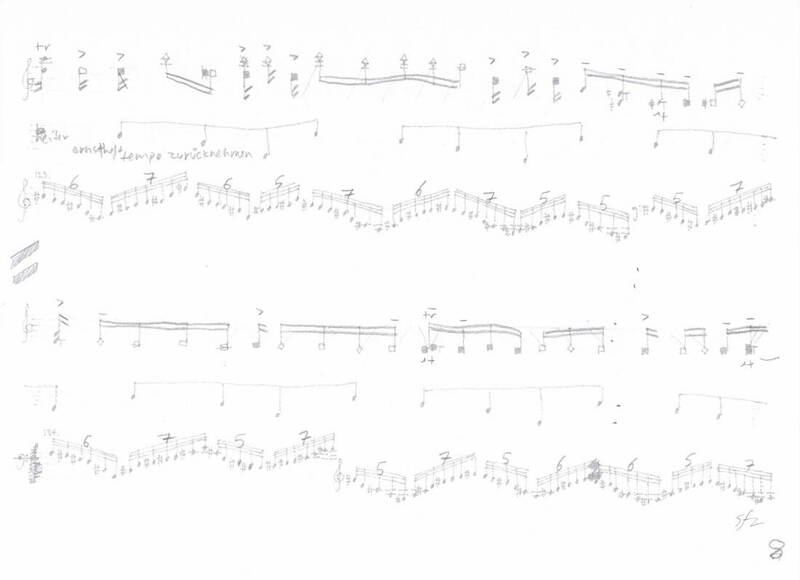 Since the articulations would not be audible to the audience, but would be enacted only mentally by the musicians, I thought that in order to communicate what I was trying to do in systematizing them, I began thinking which of the common expressions would most embody a pose and an energy of playing immediately when thought of. Working through mental exercise I began by saying the words out in my mind, and then observing my skin as it stretched and tightened throughout my body. Words like serious, immediately felt like it was doing something with my eyes, pulling them down. Using traditional staved notation enabled me to write polyphonically for these feelings in my skin when speaking articulations in my mind. Thus I would direct serious to my mouth, then to the tip of my toes, then to my left hand holding the trombone, back to my mouth and so forth. Changing and contrasting the articulations between the cutaneous figure of the instrument and how that motionless skin was meant to articulate the contact. The trombone recasts my research questions in the direction of what could be defined as the audibility to the audience. The trombonist is asked to play their touch, in other words to move their attention to each contact point they have with their instrument. In the score this is expressed in semi quavers, steadily moving from mouth to right hand to foot, and mouth to right hand to bell. Here I use the word foot to describe when the spit opening, or water key is rested on the tip of the foot, the resting can be done anywhere from a shoe to having bare feet. This triplet repetition is intersected with an exercise in imagination. While silent the musician is asked to perform german articulations while blowing the brake tone of the trombone. This complex sound is similar to my Heel where my argument met Jerrald Levinsons theory of music, and the musician is asked to try and feel those touches as a single body of touch. 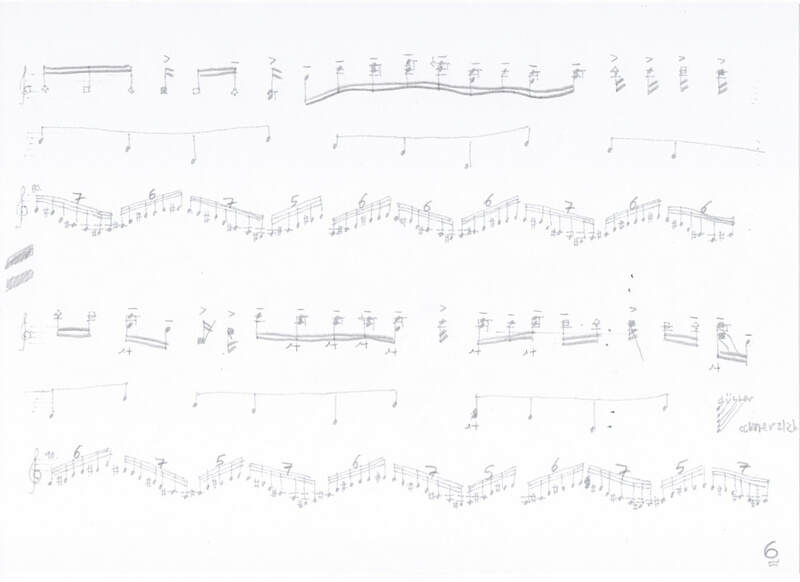 In this sense critiquing Merleu-Ponty's writing on how many touches any one person can feel at the same time in ten or twenty seconds, depending on tempo. 1. The properties of silver and silver production were a research focus in my piece Trafficking Values. The violin is tuned in orchestral tuning. 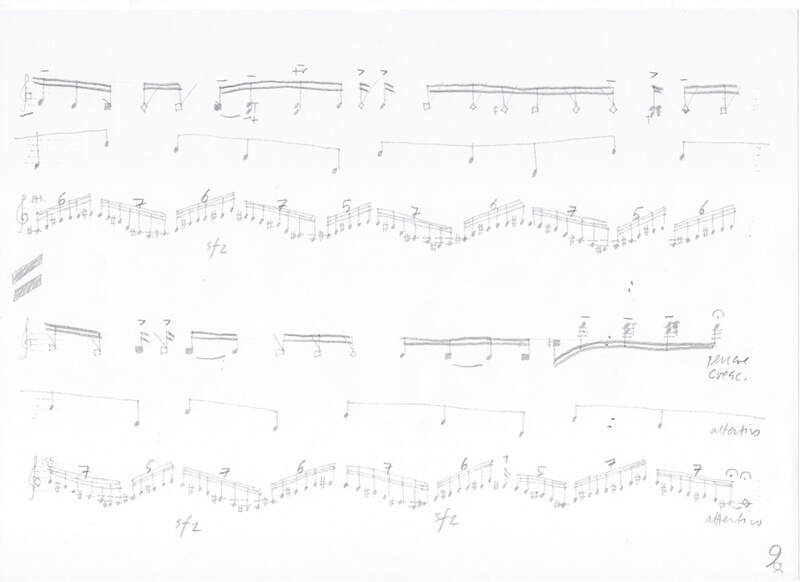 The violin part is the most difficult to balance in this piece. The two other parts for trombone and guitar are from very quiet to silent, thus the violin part with its crunches is much louder than them. This recast my research questions as what can be heard, and the way a sound can create a wall between someones perception of things. There are six different notations for the violin, they are flauto, tickle, flauto crunch, crunch, normal note, normal note with added tickle. 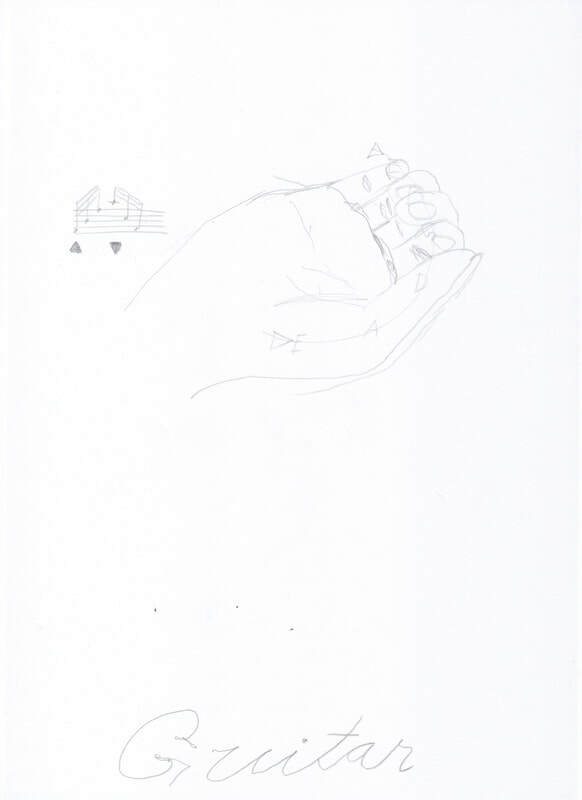 Each of these touches that the musician is asked to perform with the finger digits are mapped out by their padding, which is numbered starting from the fingertip as 1 to 4 ending on the pad of the palm. 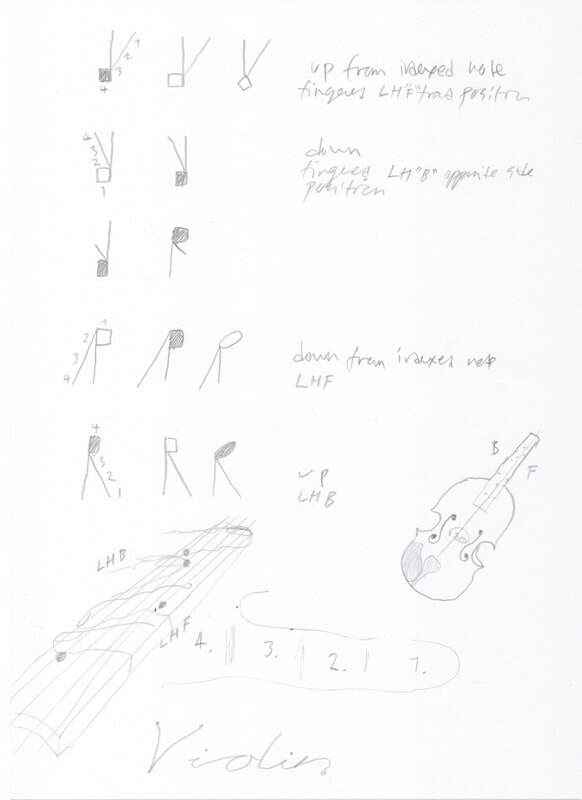 ​The guitarist is asked to roll his right hand over the pitched notes in the left. Rather than separating the two hands into their own systems I have sought to tie them together permanently throughout the piece. Unlike the trombone part, which is silent, the guitar part is barely audible to the audience. The left hand is asked to pitch an A major seventh arpeggio which repeats irregularly between three different tuplets: five, six, and seven against the other two instrument which have a steady pulse. Described in bodily terms this would be the irregular breath against the steady heart. What the guitar part shows is how touch and sound are sometimes negatively related in that when the sound is louder the touch is lighter and when the touch is strong the sound is quiet. This is made evident by tying in the articulation to the indexing of amplitude in the violin. ​The design feature of the paper score I am writing is in enabling the representation of simultaneous events in time, while only indexing space and touch. 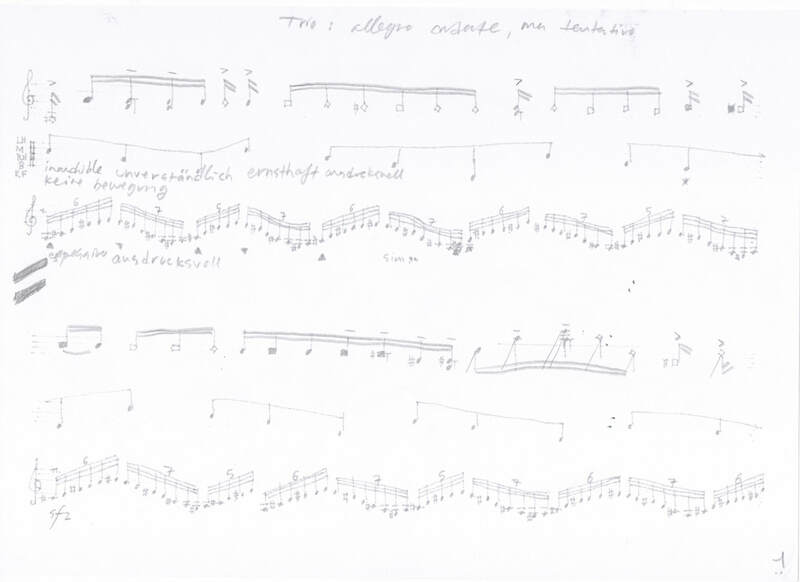 This piece interrogates the relationship between seeing touch and feeling touch in music and the corresponding differences between the same experience when it happens between the audience and the musicians or the musicians and other musicians. The instruments touch on the body, so that the musician starts to think about the instruments texture, its temperature, and shape and where the weight of that shape is is supported by their bodies, and what is its possible reach. This exploration should be such that they make the audience aware of a focus of touch in the music that they cannot experience. 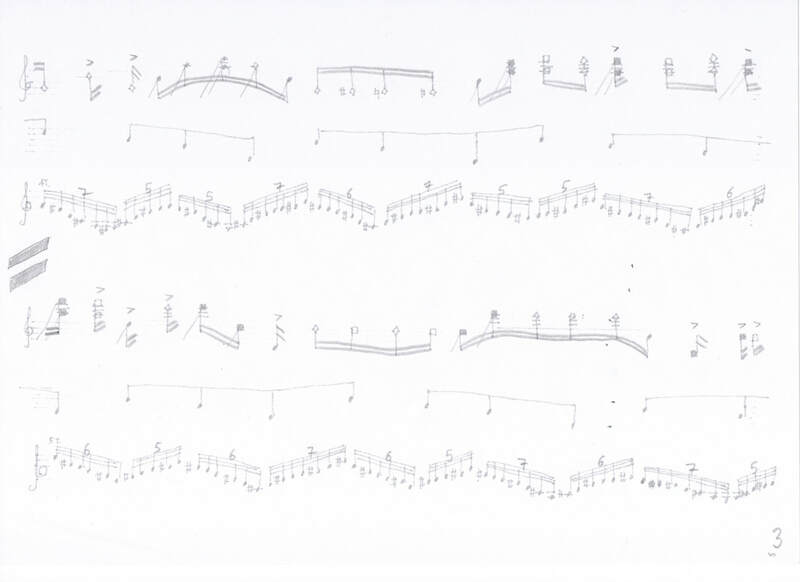 The musician plays the music from a traditionally notated score, thus performing the touches as described, but focusing their thoughts and listening on the touch itself. The audience’s experience is not this and they only see and hear the touching rather than are participants in the touch itself. While opening up music to re-learning, with a special instructions, to think about touch and touching the instrument but to also see the touch and to understand that the touch which is happening now is part of musical experience. This is even more interesting when one has played for several years, possibly decades, changes the abstract metaphorical language used to describe touch into a material practice. 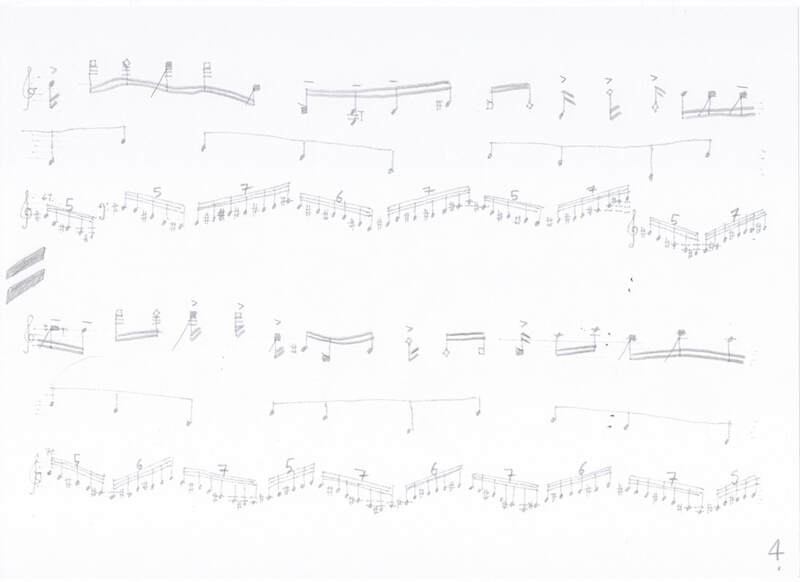 Simple and repetitive phrases are used to limit the variety of movements available to the musician and in order to allow a focused approach to some touches possible to them. This feeling of the touch as an experience of the music is available only to the musician, and it is experienced haptically by the audience who see and view the touching action empathetically. This process also changes the way in which music can be listened to explored more in Fourteen Times In Touch.